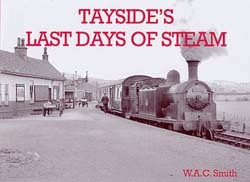 An impressive collection of 55 of the author�s evocative photographs, accompanied by detailed and informative captions illustrate Tayside's railways in the last years of the steam era. Locations/stations featured include: Ballinluig, Tay Bridge, Dundee East, Barnhill, Camperdown Junction, Carnoustie, Elliot Junction, Arbroath, Montrose, St Cyrus, Bridge of Dun, Forfar, Kirriemuir, Blairgowrie, Almond Valley Junction, Almondbank, Crieff, Dunkeld, Aberfeldy, Killiecrankie, Blair Atholl, Perth, Muthill, Rumbling Bridge, Bridge of Earn and Dundee West. An excellent book with a range of photographs which captures the bygone days and nostalgia of the area. What is of particular appeal is the easy reference to the map on the inside cover. I live 'way south of the border' (Rotherham. My mother-in-law bought me the book on a recent visit to Dundee) and I have never visited the area but with the map it makes things more relevant. I will be purchasing more Stenlake books in the future.